Adult Dance Classes Woodbridge: Can Dance Help To Relieve Your Stress? If you have checked out our blog before, you have likely noticed that there are a number of different reasons people choose to take dance lessons. For some, they want to get into better physical shape, for others, they want to prepare their dance moves for a big event. However, these are not the only reasons we see people at the Modern Ballroom Dance Studio. Another explanation as to why many take dance lessons has to do with lowering their stress levels. That’s right, many people like to let loose and let go of their worries in dance classes. What is it exactly about dancing exactly that makes people leave their stresses at the door? Let’s delve deeper into this. 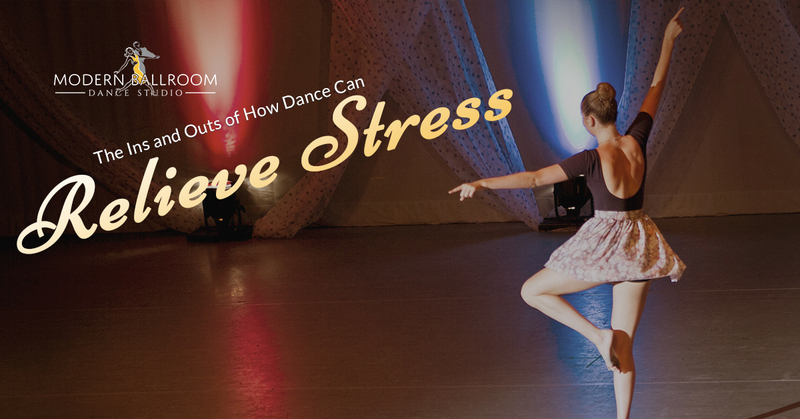 The real science behind why dance can successfully act as a stress reliever comes from the much research that has concluded that when the body feels good, the mind will feel good as well. Any time you participate in any sort of physical activity, there are neurotransmitters, as well as endorphins that are released. These work to alleviate any symptoms of stress you may be experiencing, improving your overall perception of the world. When you come to dance class, you will likely leave in a completely different mood than you arrived in, especially if that mood was negative. Additionally, endorphins will also improve the overall quality of the sleep you get, helping you to feel better for longer than just the duration of your dance class. As adults, it isn’t as often as we would like that we are able to express ourselves creatively. Between balancing your job, your family, your friends, and more, you may not even be able to remember the last time you did something that allowed you to show off your creative side. Dancing is a great outlet that gives people the ability to express who they are through both movement and music. You might even discover a part of yourself that you never even knew was there. You will truly never know until you try! As we mentioned in our opening, there is the added bonus that dance can be used to help you get into better shape. You can increase your flexibility, build muscle tone, and get great cardio in all at the same time. The best part? Dancing is a workout that all people, no matter what age, can participate in. Along with these improvements, dancing can also help you to do the following, all of which will help to alleviate stress. Ready To Sign Up For Dance Classes? If you want to de-stress and do good by your body, it may be time for you to sign up for a dance class at Modern Ballroom Dance Studio. We offer a number of different lessons and classes, including social dance. Contact us today to learn more about our studio and how signing up for dance classes could benefit you.